It's great to be included again in a Treasury. It's the 2nd time this week. God is good to me. *beam*. 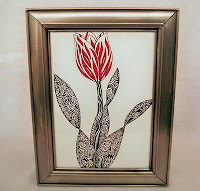 My Red tulips drops w ere featured in Kugey's Red Tulips are so pretty treasury. 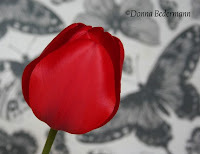 I love the red tulip against the gray/black background. It really makes the photo pop! Also, it's a great change from the expect-able rose to the beautiful but less featured tulips. This drawing did not capture my heart at first sight. However, as I look deeper into the picture, I noticed the intricate designs and patterns of the leaves & tulip flower. Gorgeous. Lastly my beautiful drop earrings that are available in 9 different colors. 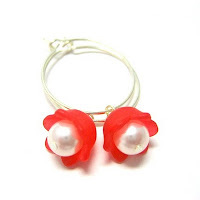 I love these Lucite flowers beads that are just fun and beautiful to work with. Congrats on being in that treasury!! ooohh lucky you! good karma this week! Have a great weekend! I found your blog through etsy forums and just wanted to say hi and that your blog is lovely! have a beautiful wednesday! haha, by wednesday, i meant weekend!!!! :) i need a nap!